Almost every one of us are interested in Zodiac signs in one way or the other. Some of us read the daily horoscopes, some have the habit of reading about different signs and try to get better understanding about a person, and some look for the compatibility and the list goes on. We have matched different zodiac signs with different food items. 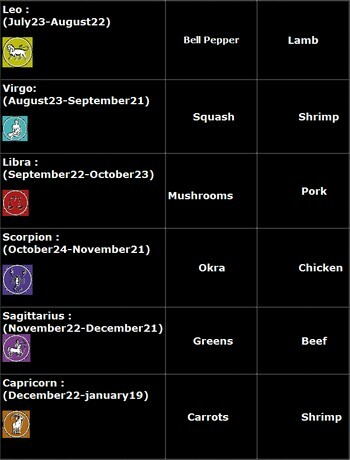 All you have to do is pick a sign and prepare a dish. The sign you pick can be yours or your family memberâ€™s or friendâ€™s or even your pet’s. Trust me, we won’t ask to see the horoscope. 😉 You can also share the reason for selecting the particular zodiac sign and a few characteristics or information about the sign. The contest is open to all (for both bloggers and non-bloggers). 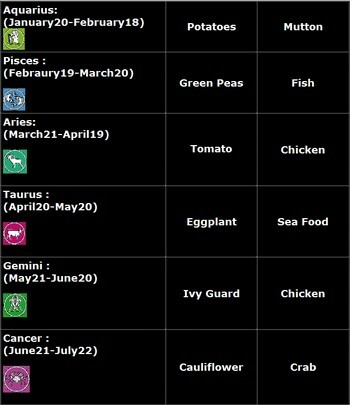 Pick a zodiac sign and its corresponding food item listed in the above picture. Whip up a delicious dish with it. When you post the recipe(s) in your website/blog, please mention the event and the logo (you can copy the picture from here and resize it) along with a link back to this contest post. After publishing your recipe, leave a comment in our event with a link to your posted recipe. We will take the required information from your website without you sending an e-mail. You can still participate in the contest. 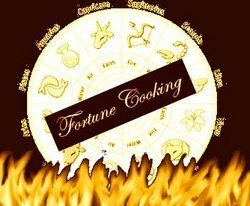 Just email your recipe to us to tastyspicy at gmail dot com with subject “ST’s Fortune Cooking Contest”. In the body of the email include your name, city/country, the recipe with a title and pictures of your dish. And also leave a comment in the event post so its easy for us to chose the winners in lucky draw. Contest ends on June 1, 2008 midnight Eastern Standard Time. Make sure you have your entries in before that. Winners will be announced on June 5th. 2 winners will be chosen randomly by a lucky draw at Random.org. All contest entries will be featured in a special post with a picture, link to the blog post (if any) and the title of the recipe. Winners will be notified by email and will have 48 hours to claim the prize or another winner will be chosen. The whole point of this contest is to have fun and we would like you all to get in the fun. If you’d like spread the word to friend’s and family as the more entries we have the more exposure everyone will receive. Also, please take the time to visit our sponsors as they have been kind enough to sponsor the cool prizes. Thank you very much for conducting this interesting contest. Looking forward for the roundup! Hey shriya,atlast i submitted my entry in the last moment. Here you go. Nithu and Shriya…Here comes my ver last minute entry..It was a real thrill to put mine here in this stack..thanks for the lovely contest. This is my entry to the Fortune Cooking Contest. I dont know if my previous comment made it thru. So taking no chances. Here’s my entry to Fortune Cooking Contest. Just posted my entry for the fortune Cooking contest. Thanks for the wonderful event. I got an email that I have something waiting on your blog. Hmm.. couldn’t find it though!